The TV and newspapers this week are understandably dominated by nostalgic stories of past Olympic triumphs as they build the hyperbolas of London 2012. Everyone hopes that the event will be a success, that there will be no security issues and that Scotland will lend enough of its sunshine to England to keep everyone happy and the track events dry and fast. Weymouth is ready for the sailing events after the recent floods but I can’t help recalling the pictures of the slimy green beaches and sea in Qingdao, just before the last Olympic Games. A few weeks before the event, there was a massive bloom of green algae (Ulva, previously known as Enteromorpha, shown left) which had to be removed by hand using more than 10,000 workers. The cost of clean up was estimated at $100 million by Chinese economists. The time and cost was partly rewarded by a successful event. At the time of this incident, there was huge embarrassment and the cause of the problem was unclear. To their credit though, Chinese scientists later investigated the matter very carefully and published their findings in a transparent manner. But by that time, public attention had moved on and it was no longer front page news (or any page at all in most newspapers). There are lessons we must learn however. Ulva prolifera, sometimes inaptly named ‘Sea Lettuce’, is rather common along those sheltered margins of the sea where plant nutrients are abundant. These conditions seldom appear naturally and there is usually a human activity to blame somewhere; anything from incompletely treated sewage effluent to agricultural runoff. In Devon, just down the coat from Weymouth are some lovely shallow sandy beaches that get clogged up with Ulva in the late summer and it is common to see bathers picking their way over the algae on route to the clearer water beyond. But this is incomparable with the Qingdao incident. Ulva is normally restricted to the coastal margin but the bloom in 2008 covered 2,400 km2 of water. The source of the problem in Qingdao was initially elusive and it took the combined efforts of biologists, physical oceanographers and experts in remote sensing (see Hu et al, 2010) to work out what had happened. 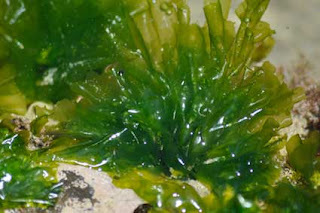 The bloom was not the immediate result of nutrient pollution in the vicinity of Qingdao but started some 200 km away at a huge seaweed aquaculture site on the turbid Subei Bank where the red alga Porphyra yezoensis (known as lava or Nori in the UK) is grown. Following a spectacular growth in the industry, some 44,000 Ha were cultivated by 2008 in the Jiangsu province, 95% of China’s production. The algae are grown on rope nets suspended from bamboo rafts and Ulva is a common and dense nuisance species. When Porphyra is harvested, large Ulva slicks break free and travel through the turbid sediment-laden waters towards the open Yellow Sea and eventually to the Qingdao coast or some other downstream destination. When they reach clear waters where there is plenty of light and nutrients, growth is almost explosive. This did not simply happen in the Olympic year; the Olympic Games provided the grandstand to a recurrent problem. Profits from Porphyra yezoensis production were US$53 million in 2007 so the environmental impact vastly exceeded this figure in the Olympic year (of course this was not a normal year). The whole incident raises important issues though. Cultivation of Porphyra yezoensis has benefits for the environment as it helps to remove excessive nutrients that could otherwise trigger eutrophication characterised by an excessive growth of phytoplankton and, in the worst cases, by an oxygen-starved ‘dead zone’ (see my article in Scientific American). The huge concentration and rapid growth of seaweed cultivation in Jiangsu province had unexpected environmental consequences however; it is entirely possible that additional fertilisers would be required to maintain the huge cultivated area. At SAMS as in Chinese instiutes today, we are very carefully studying just how much seaweed can be safely (and beneficially) cultivated at each site and what are the optimal techniques for doing it. Seaweed aquaculture is an attractive investment but the Olympic Games have taught us that it isn’t plain sailing.